I'm sitting here with the heat running high and watching my tea waft little wisps of steam into the air. The daffodils under the trees are hanging low, but I am hoping the sun perks them up. February and March can be such surprises, weather-wise. Of course all the plant life had been convinced that cold days were a thing of the past. My tulip tree (saucer magnolia) seems to be hardest hit every year. It will put out buds in December if the days are warm and try to bloom early. When I was at LSU, they had a circle of these lovely trees at one end of the campus, not far from the art buildings. In the spring you could walk into the middle of the circle and be surrounded by a ring of lightly scented, purple and pink petals that had fallen to the ground. It was almost magical. Today will be a nice, long production day, uninterrupted by classes. First I will head to the studio and box up some pieces for the gift shop at Stowe Botanical Gardens, and take them over. Then back to making pieces. Hope you have a good day! I took a shot of my blooming daffodils about a week or more ago. Now they totally surround a grouping of trees in the back yard. The ones in the vase are from various points around the front and back. I have double flowers in the front that are pale yellow. In the back I have the old standards-single flowered and bright yellow. Out under some crepe myrtles I planted tete-a-tete, the small, sweet little daff that has brilliant green leaves. I love these flowers because they are hardy, don't need assistance once planted and come back each year and bring new friends with them. The perfect house guest or plant! The draw back is that they don't last long once you cut them. But I enjoyed them this morning with the rain beginning to fall, the red maple in bloom outside the window and the lovely smell of bergamot from my Earl Grey tea in my Ruggles and Rankin teabowl. Great start. Hope your day is full of spring. My sister, Tammy, has a great house to display pottery. In fact, she has so much pottery from that it always amazes me. She and my mom have taken quite a few "seconds" over the years. I put so much effort into the carving and glazing that it is a shame to waste a bowl that has a small flaw in it. So they have taken many off my hands, and the other has gone to my home. We just got back from our trip to Mississippi. 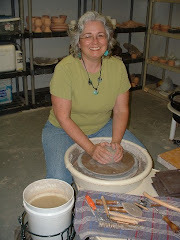 I was able to have a showing of work at a very nice gallery in Hattiesburg and they have placed an order for pottery. My generous sister also had a "pottery party" at her house and invited her friends. It was fun and a great success and now I have lots of orders to work on. During the 4 days we were there, we picked up my brother in law in Mobile, Ala., back from a 28 day rotation in the oil fields of the middle East, did the gallery thing in Hattiesburg, welcomed Jim's mom and dad, Rosie and Jack, who drove in from the Fla. coast to see us, set up for the pottery home show, went to an auction in the middle of nowhere (which equates to 45 minutes of hard driving on the back roads of Mississippi) and had a few hours at breakfast on Sunday to see my dad who had driven in from Baton Rouge, LA on Sat. night. He will be 72 and he is still working for a car dealership in LA about 3-4 days a week and commutes 2 and 1/2 hours to works. It was action packed to say the least. Now it is back to the studio and classes and firings. I made out a list of work that I have to get done and laid out the materials so I can just start on it after my class tomorrow. In my Monday class we have been exploring underglazes and will be working on slips, then trying out lusters and enamels. The enamels will be new for me and I haven't done much luster work in the last couple of years. Should be fun. Have some photos that I will upload of the home show work tomorrow, hopefully. and that's it, I think. I know a lot more potters but I haven't seen them work. You get to see the finished products but not the techniques they used to get to that stage. I have been to a lot of workshops and seen regional and national potters but that is different than the people you hang around with. But on that note, I am looking forward to the NC Potters Conference in March. There are three great potters I am excited about seeing. It is always an excellent weekend with lots of new info and a ton of pots and the Gaston gang to have lots of laughs with! Thanks Ron for reading my blog and bringing my camera to me! I had left it at the Arts Council and had not figured out how to work a trip to Shelby into my schedule. I have been making pots furiously. We are going to take a short excursion to Mississippi to see family and visit galleries and have a little spring home show. I've also been gearing back up for classes which start next week and an order for a gallery that needs to be done in March. One of my goals has been to reach out to more galleries and develop more wholesale accounts so that I would be able to stay in the studio and make work. I think I will always do some shows since I love to see how people respond to new ideas and new work firsthand. But the traveling and loading gets to wear on you after a while, especially since I do it by myself most of the time. That is my own preference, because I like to pack the pots a certain way and pack the car a certain way and set out the pots a certain way. "Certain Way"--maybe that's my mantra! Anyway, my sister has volunteered to help do mailings and contact galleries for me (she made the offer last year and I have not been able to take her up on it yet) and that is my plan this year. On another note, a friend brought in an interesting idea for needleworkers and she would like to see it made in pottery, so I will be trying out a prototype piece to see if it will work in clay. Well, off to trim pots and put handles on mugs. I love to see this rain and feel warm and cozy in the studio with a full day ahead of clay! Been a while since posting. I was out of town visiting family (a New Year's resolution and recognition that everyone is getting older, me included), then came home to rush and get ready for Treasures of the Earth opening. Pictures may follow but first I must retrieve my camera from Shelby, where I left it on opening night! I always love to see how people's work has changed. I really enjoyed seeing everyone's pots this year. Especially intrigued by Julie's work and the crisp lines she creates with slip. Again, maybe images will follow, and then, maybe not! The class schedule for throwing and handbuilding finally came together. I was working around holidays, school schedules and show commitments and sometimes it is a bit like juggling. Looking forward to having old timers and new people in the studio. Well, off to sleep and clay dreams of spinning wheels and dancing pots!